Although it remained possible Yasmani Grandal would accept the one-year qualifying offer from the Los Angeles Dodgers, it wasn’t a likely scenario and thus they went into the offseason figuring to need to address their catching situation. They were linked to Yan Gomes early on, but the Cleveland Indians traded him to the Washington Nationals. The Dodgers then factored prominently in J.T. Realmuto trade speculation as the Miami Marlins fielded offers for the All-Star. The process spanned multiple months before coming to an end this week with the Philadelphia Phillies acquiring Realmuto. The Dodgers, Cincinnati Reds and San Diego Padres heavily involved in trade talks, while the Phillies were considered a late entrant to the sweepstakes. 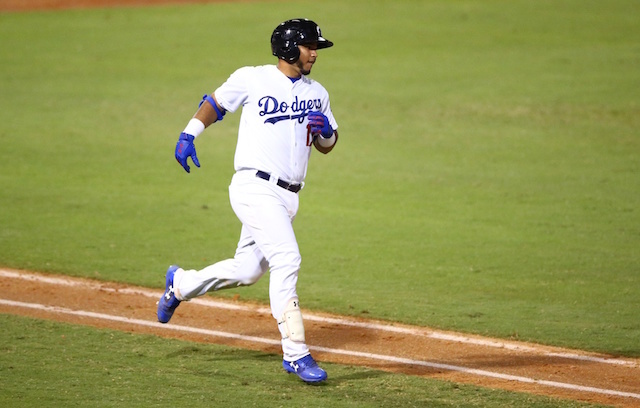 The quartet of prospects are among the most-heralded in the Dodgers farm system. Ruiz was rated the No. 3 overall catching prospect in baseball by MLB Pipeline, and tops overall in the Dodgers organization by Baseball America. He nevertheless was someone the Dodgers reportedly were willing to part with in a Realmuto trade, but it’s unclear if they would have done so while also including Lux, May or Smith. The Marlins ultimately received a haul from the Phillies that was comprised of Jorge Alfaro, Sixto Sanchez, Will Stewart and an international bonus slot. Alfaro was the Phillies’ starting catcher, and Sanchez their top pitching prospect.